← You’ve Had a Near Death Experience: Now What? William James, the great psychologist and spiritual researcher said his investigations were often the search for the “white crow” that proves that spiritual realities are real. He meant that although conventional wisdom was that all crows are black, all it takes is one white crow to prove that other realities exist. In spiritual research, the search for the “white crow” has come to mean the search for that one case that proves beyond a doubt that consciousness can exist beyond the brain and body. The late great Ian Stevenson told me when I started as a young near death researcher, “Melvin, find that white crow that proves NDEs are real, and you will prove that consciousness survives the death of the body. I have found my white crow. She is a 40 year old woman named Angela Ronson. She suffered a massive brain bleed from an AVM, in 2002. She writes about her experience in the Journal Stroke Connection with the headline “What Kind of Vegetable Am I?”. 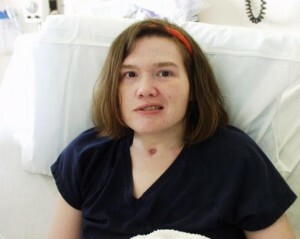 (Stroke Connection: American Heart Association Affiliated Journal July/August 2009: For link to Stroke Connection Website Click here For link to article Click here For seven years, Angela was in a coma, waxing and waning, often in a “semi-vegetative state”. For two years, Angela suffered the “locked in syndrome”! This is a horrifying condition in which the patient is conscious and yet has lost virtually all motor function. Very few of these patients recover any motor function, much less walk, talk and basically function normally, as Angela does. Some patients with locked-in syndrome have to communicate with the outside world by sniffing or blinking their eyes. Angela is a regular and avid participant in Twitter! (angela70). Yet she has bitter memories of hearing her family and physicians talking about her while she was in coma, describing her as likely to be a vegetable for the rest of her life. Angela’s miraculous recovery and return to full health has been nothing less than heart breaking. Prior to her stroke, she was a highly educated woman with a Master’s in Special Education and a Program Manager for Early Intervention projects. Since she was not expected to survive, after she returned to complete consciousness, she discovered she had lost everything. As in everything she owned, her personal possessions, her pictures, clothes, her home, her savings, every scrap of anything having to do with her former life. She lost her children to Foster Care with the State, and her own sister had to fight for a year just to get custody of them, while Angela was in coma. After her coma, she had to start her entire life over again. Her children, who are teenagers, could hardly remember her as a Mother as she was in coma for so long. She currently lives independently and supports herself as a Professional Writer. Yet she still only sees her children part-time, and feels she has lost them as well as everything else she lost. There are only a handfull of patients who have recovered from such prolonged comas. Most of those, after awakening, oddly enough died soon afterwards. Most of the rest were left with profound handicapps, unable to walk or even move their limbs. They suffered the horrible consequences of not moving, being fed by a tube, and complete inactivity for years. The great majority of these patients often wish that they had simply died and never recovered, as their life after years of coma is so limited and painful. Yet Angela is an alert lively woman with a great sense of humor and determined positive outlook on life. She is actively blogging and tweeting. She primarily is helping others to have a positive outlook on brain injury and stroke. Most of her blogs give practical advice on rehabilitation and dealing with the government. She has developed an impressive network of cutting edge brain researchers, and is particular well versed in functional neurogenesis. Her extraordinary recovery and what she has done with her life after seven years of coma (and semi-coma) is one of the most inspirational stories I know. This entry was posted in Angela Ronson, Remarkable People and tagged Angela Ronson, coma, consciousness, locked in syndrome, Melvin Morse, near death experience, science, spiritual neuroscience, spirituality, stroke. Bookmark the permalink. I am so glad that you are able to do all this. I am not sure how but really God has a purpose in all this. Really God is the only reason you have recovered this much due to the consequences of someone else. Anyways i hope u do read this. thisme in a short form of sleeping thn slowly waking up. Nobody understood myself inside my brain. I wanted to all go away, for the love of of my Family, friend’s chils ex. all, just wait i thinking now. Hey no feeling sorry I’m a surrvior and darn proud. Thank’s to the lovely education of or dr. here in Kamloops B.C. good life start’s now, dean c.